A Tufted Titmouse perches on a branch of a fading sunflower before heading to a nearby birdfeeder. 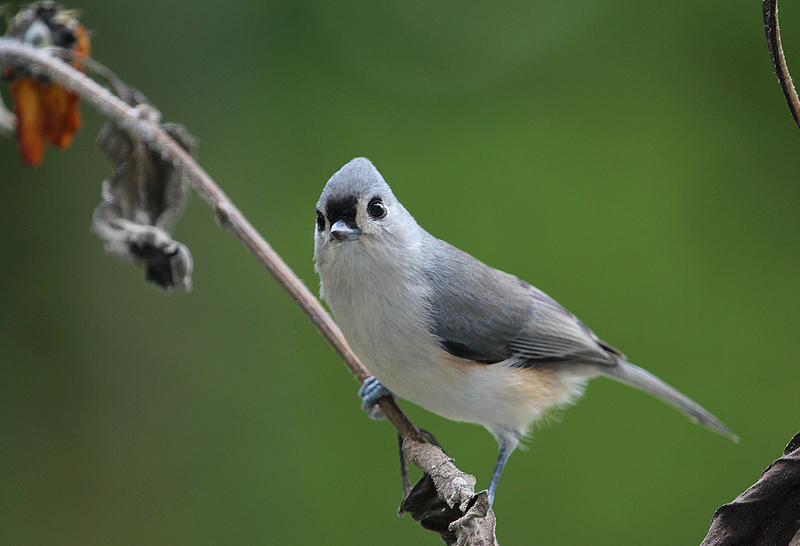 This photo of a Tufted Titmouse is pulling double duty. It accompanied my latest column in The Hour (Norwalk, Ct) and The Keene Sentinel (Keene, NH), which may be found here. It is also being used on this post to kick off a celebration of our common backyard feeder birds. This is a great time of year for feeding birds as the feeders are active with titmice, chickadees, nuthatches, cardinals and other birds. Under the feeder, birds such as White-throated Sparrows and Dark-eyed Juncos have returned. So to celebrate that, I’ll post a series of photos highlighting some of our more common, but beloved, backyard birds. This entry was posted in backyard birding, birds of new england, chris bosak nature photographer, For the Birds column, landscaping for birds and tagged backyard birdfeeding, backyard birds, Chris Bosak, Tufted Titmouse, Tufted Titmouse on sunflower plant by Chris Bosak. Bookmark the permalink.